The Xenomorph has faced off against a surreal line-up of science fiction celebrities. Most famous is his repeated clashes with the Predator, but over the course of 30 years of spinoffs, the drooling insectoid has also done battle with Superman, the Terminator, the crew of the Starship Enterprise, Batman and Judge Dredd. Now, according to this new Alien: Covenant poster, it might be up against its most deadly opponent yet: Michael Fassbender. Or, to be more specific, Fassbender’s identical androids, Walter and David. We don’t know much about Walter yet, but David was last seen reduced to a talking severed head at the end of Prometheus. It remains to be seen precisely what threat a talking head might pose to the universe’s most perfect killing machine, but unless he plans to roll across the floor and gnaw at its ankles, it’s probably not going to be a physical one. 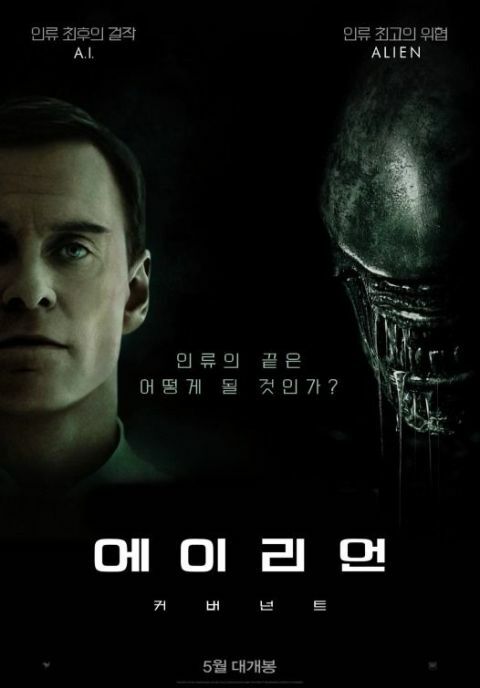 Nonetheless, plot rumors hint that the android pair will be posing as much of a threat to the crew of the Covenant as the Xenomorph does, possibly involving some kind of robotic mutiny against the crew or maybe that old chestnut: the android with an ulterior motive from the sinister Company. It’ll be fascinating to see where Prometheus and Alien: Covenant narratively meet up and the effect an undetermined amount of time spent without a head has had on David. We’ll find out who’s going to come off best in this matchup on May 19th, when the hugely-anticipated Alien: Covenant opens nationwide.